"Thirteen long years ! That’s how long its been since Greyhawk fandom organized itself online and started debating the setting they love. What a long wild ride it has been. From a small band of fans, irate at the cancellation of their favorite role-playing setting to people who routinely produce and share their own material online. 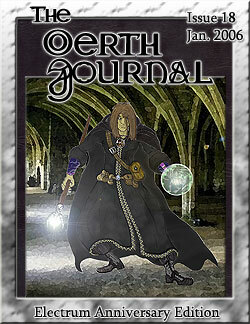 Here we are, ten years after the first Oerth Journal. It’s hard to believe two were produced, never mind eighteen issues ! Greyhawk lives as long as its fans keep it alive. Here’s to 18 more Oerth Journals !" By Creighton Broadhurst with Special Thanks to Paul Looby and Stuart Kerrigan.